The ASTM E112 standard is commonly practiced in the United States when determining the quality of an alloy. This standard is routinely performed by inspecting a polished sample under a metallurgical microscope to determine grains distribution within a specific area. 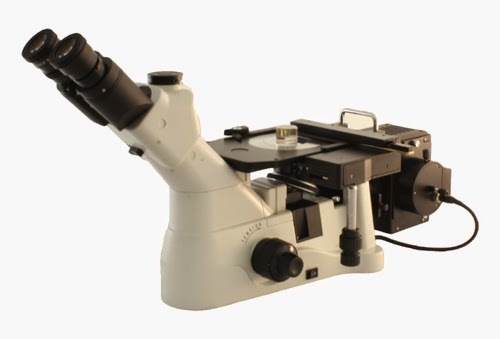 Typically an inverted metallurgical microscope such as the Fein Optic Mi40 shown below is used. Using this standard, a "G-Number" is derived, which directly relates to the quality of the alloy. The ASTM E112 standard can be performed in one of two ways. Image Analysis software, such as the Infinity Analyze Software included with the Lumenera cameras can be used, or a simple grain sizing reticle can be used. 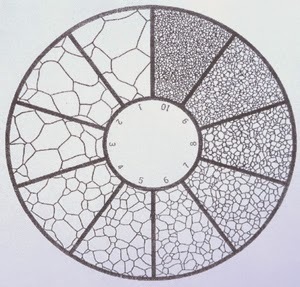 When using the grain sizing reticle, a polished sample is placed under the microscope and then when looking through the microscope eyepieces the grain sizing reticle is imposed on the image. This reticle allows the technician to estimate the G-Number based on the grain size and how it matches up with the microscope reticle. Learn more about the ASTM E112 test for grain counting here. What is a Microscope Reticule?